This is a version of my Irish Examiner Column of 12 April 2014. Companies are not people. There, I now stand in opposition to the US Supreme Court, who have held that they are people whose rights are equal to that of a natural born person. This includes the right to free speech, and gee, the same Supreme Court held that money talks, literally. Money is speech. Speech is free for people. Companies being people can spend what they like on political campaigns. And so the US continues its descent into plutocracy. Lets not forget that the US supreme court have a diabolical record in general over the last 200 years in terms of liberty, equality and the pursuit of happiness. The equation of money = speech will go down, I fear, as the modern Dredd Scott ruling. Here things are not quite so bad. Companies are not yet equated as being the same as thee and me. They have many attributes of legal personhood, and that’s good and right to allow them to conduct business. They can sue and be sued, they can be held to account in a court of law, and they can engage in contractual engagements. They have rights. Rights however come with a flipside- they bring responsibilities. Here one might consider that Irish companies are perhaps less diligent in pursuing their responsibilities than they are their rights. This week two glaring examples came back to the forefront. Companies in Ireland have engaged in and been facilitated in shirking their responsibilities to contribute to the public good in general, via tax, and in particular via engagement with higher education. Taking higher Education first, as a small but telling example. This week saw the publication of an excellent report on the financial situation of irish higher education. Its grim. Contained therein, and this is from Grant Thornton, a hard nosed a bunch of accountants as you will ever meet, is a critique of corporate involvement. They note, in a section on possible funding solutions, that Irish corporates are the lowest, in the OECD, in terms of supporting research. Yet, companies constantly plead that there is more linkage needed, that higher ed needs to be more focused on their (not social, their) needs etc. The flow is alas one way – absent tax incentives and government cofunding Irish companies do not put any meaningful money into higher education. Companies demand that society pay for the training of their workers, that they focus education on their immediate quotidian needs and that they be the arbiters of curricula. The odd, welcome, donation of part funding for a chair or a few bob for part of a building doesn’t cut it. If corporates were truly social actors they would see this, and other actions, not as good PR and as a marketing opportunity but as part of the social contract. That they do not suggests that they do not see such existing. Whenever a piece like this is penned people complain. The most common one is “sure don’t they employ loads of people”. They do, but companies do not do this as part of fulfilling the social contract. They do so because it is needed. They spend the minimum on all inputs and get the maximum output. If the corporate sector in Ireland or anywhere else could replace workers with robots that were as good and as cheap they would do so in a flash. This is capitalism, and the deal in modern societies is, or was the following : those that provide capital can extract a bloody good return but this will be both circumscribed by law and in part expropriated by tax, because we live in a society. Why people think that unfettered capitalism would not give us the modern equivalent of the chimney boy is beyond me. But if companies do not pay their fair share where then are we? Ireland. We are not a tax haven. But we are a crucial part of the international chain of non-being that allows companies to become non-existent. 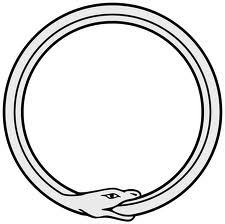 The logo of the modern multinational corporation should really be the same for all – the Ouroboros, neither beginning nor ending. , a snake swallowing its own tail. The department of finance published a report by UCC economist Seamus Coffey that looked at the effective tax rate for MNC’s. They found that it was remarkably close to the headline rate. Job done, we are a lowtax not a tax haven country. Previous work by my colleague Jim Stewart suggested that this was not the case, it was perhaps 2-3%. Now, while great guys neither Seamus nor Jim are tax accountants. If I was a company they would be low down on the list of people to call to optimise tax payments to the lowest level. Ireland has 5 of the 50 largest Eurozone legal companies. They are not large to deal with the complex HR provisions of the Irish MNC sector (which employs about 155,000 people or a mere 8% of total labour) ; they are here to manage the startling profitability of Irish registered companies which is off the charts at a multiple of 5 that of the EU average. Of course this is all real.. Of course it is. Irish companies in general pay low rates of tax. We collect a smaller percentage of GDP from tax on capital and business income than the EU average. 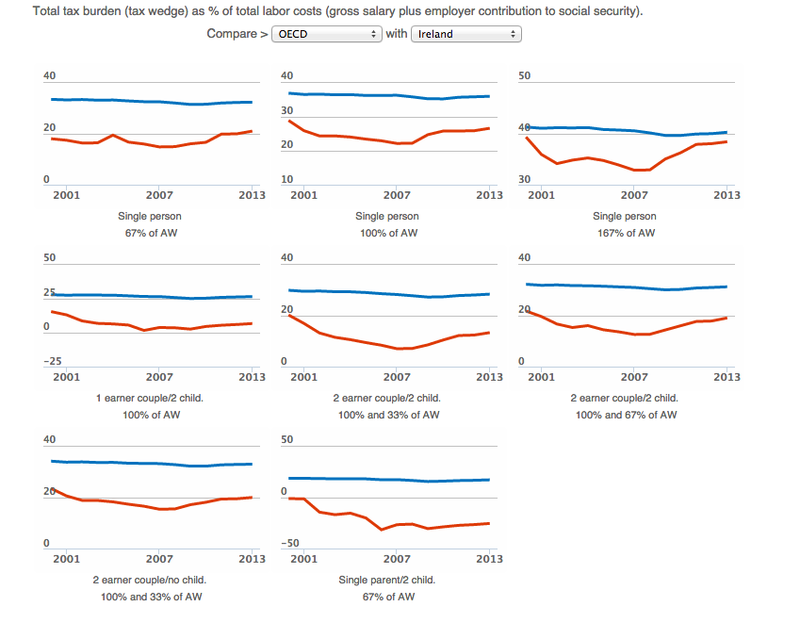 Ditto with employers social insurance contributions. We have decided to not tax them in the hope that they will out of gratitude employ people. We in doing so have fostered a MNC sector in particular which is divorced from the rest of the economy, but whose tax enabled activities distort the overall, masking over decades the stagnant state of the remainder. Domestic corporates also get an easy ride – there are a bewildering array of reliefs, write offs and shields for directors and owners. It is simply capital welfare. The reward to capital should be treated the same as the reward to labour, and that means tax rates that are the same. The 12.5% corporate tax rate has become a totem – but as late as the actual Celtic tiger of the late 1990s when we had a truly export based real economy the rate was in the late 20s. Perhaps then we had it right? The reality is that companies will press for the lowest tax rate possible – zero (or less) would be good, as many Irish companies have achieved. Society, which despite the echos of Mrs Thatcher’s claim, echoed and filtered even into the minds of soi disant socialists, does exist, should press for a rate that is fair within the context of society. Alas, when the political class is captured by the myth mirage and spin of corporate welfare seekers then there is zero chance of that. If companies didn’t leave in 1995 or 2003 when our corporate tax rates were much much higher then will not leave now. Unless of course they were here only for the tax rate…which we are told they are not. This entry was posted in Blogpost, Journalism and tagged companies, double irish, economy, oroubos, tax on April 12, 2014 by brianmlucey. Equality is good – but it costs. A version of my column in the Irish Examiner. The last few weeks we have seen yet more charitable and voluntary bodies being raked over the coals of media stoked political charcoal, regarding their salaries and payments. A new line now seems to be emerging in government; that those who are in receipt of public funds should have their salary details made public. That makes eminent sense. Of course, it would be much more credible were it to be actually done. Eamonn Gilmore is not powerless in this regard. He is the deputy prime minister and the leader of a minority party without whos support there is no government. We have seen minister after minister come out and leap on the bandwagon of public concern around salaries. After a few trots round the track they quietly slip off and hop back into the merc for a bit to recuperate. Its also notable that while they have stood back and held the coats while the charity sector gets a licking they seem to be joyfully powerless to compel details of, say, NAMA or NTMA staff, or the staff of the state supported or bailed out banks. Its never clear if the call for transparency is around a significant sum being given from the state or if a single penny is enough to require transparency. As in so much this is reflexive gobwagoning. Transparency is in general a good thing. If the ministers truly wished to have transparency across the salary pitch they would adopt the Nordic model and make tax returns public. Yes, yours. And mine. That would at a stroke render moot the staged faux outrage by ministers and baa baa baaackbenchers around pay. While it would satisfy the prurient itch in all of us as to what our fellow workers and neighbors earn it would also act as a powerful signal. That signal would not however be one that any Irish government would wish to send, as it would be a signal of the true state of inequality in Ireland. The reality is that we are seeing in the world the rise and rise of a plutotarchial class that would put Marcus Crassus to shame. At one level this is the reward for disruptive talent. Some inequality is good as it acts as a spur. If people see that talent is rewarded that hard work pays off and that risk is rewarded than they will act accordingly. But the evidence of economics and the feeling in many peoples guts is that this is very nonlinear. At higher levels of inequality the situation flips – why work hard, why invest, when the hyperwealthy have all the power. The oldest golden rule is that he who has the gold, rules. The wonderful book “The Spirit Level” makes a strong case that it is income inequality within countries (as well as between them but more strongly within) that matters for social outcomes with long economic tails. Child welfare, crime, social deprvation, social inclusion, interpersonal trust and social mobility, all these are strongly associated with inequality. More inequality is associated with poorer outcomes in these metrics. In the domestic context an interesting recent finding suggests strongly that innovation and income inequality are related, strongly and negatively. The less unequal societies are the more innovative it seems they also are. And innovation, we are told, is A Good Thing. A practical and chilling example of how the rich will eventually choke on their own money was shown recently.Research indicates that 90% of the growth in consumption in the USA over recent decades came from the top 20% of income earners. In the end, if there is no mass market for products then companies will cease innovating. We will see stagnation in product innovation and in the end in the very engines of growth that have propelled the 1% to power. 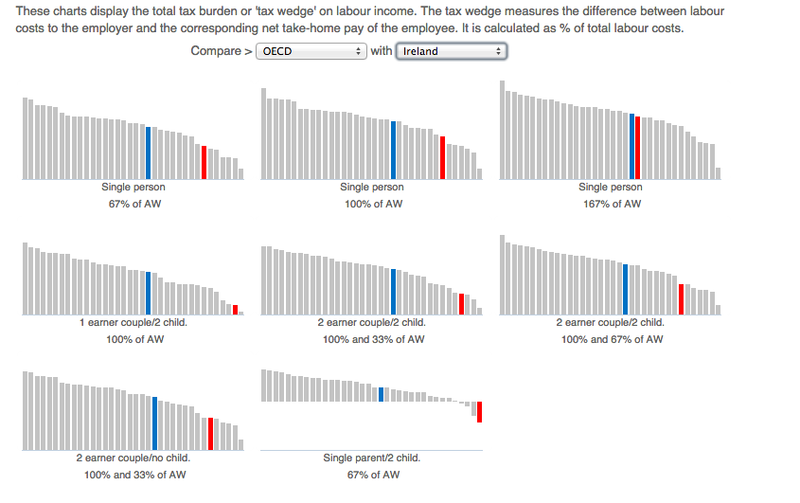 Ireland is not an especially unequal society. Inequality in Ireland tends to be a feature of the bottom not the top – we have quite a gap between the lower earners and the median earners, but not as much between the median and the higher earners. Nonetheless, we are by no means an equal society. Greater equality can arise only by redistribution of wealth. Power and money beget power and money and thus relying blindly on economic growth will not and has not resulted in less inequality. Redistribution implies tax. Nobody likes tax increases, but a higher rate of tax on higher earners would result in at lest in principle an ability to reduce inequality. The difficulty for politicians is that they cannot persuade people of the need for same and will not . Leaving aside the lack of a vertebral column amongst our leaders, the issue is also rooted in behavioral economics. Those who do not have sufficient income to be liable for any increased income taxes are unlikely to vote for them in any case. People like lottery type payoffs with positive skewness – in other words, they like the chance that they may make it big. And if they were to make it big, to become the high earner, they would not wish to pay the higher tax. The difficulty is that the preconditions to achieve high payoffs may require higher taxes to engender them. This entry was posted in Blogpost, Journalism and tagged economy, income inequality, ireland, politics, tax on February 22, 2014 by brianmlucey. As is often the case with Eddie there are some solid points made but its as usual hard to find these within an overblown emotive and bitter tone. Clicking on the chart will give you a page from Eurostate which is the latest cross national comparative data on tax structure in the EU. The chart is for ireland. Its compared with GDP because guess what – thats the international benchmark. WE have decided that we want to shelter a MNC sector and so complain we want to use GDP. On that Eddie and I are at one. IT wont, shouldnt and isnt washing with our partners. So, lets see. The rankings are 1 = highest. We are very much towards the bottom with regard to tax paid by employers. We are very low with regard to the % of tax collected by indirect taxation (VAT). We are very low in terms of business capital taxes. Etc etc. A whole herd of sacred cows that gallop through the national debate are turned into hamburger by the facts. No, Eddie, we are not oppressed by the state.